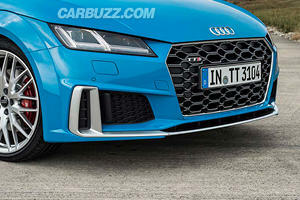 Once again sharing basic underpinnings with the humble VW Golf, the Audi TT S is anything but a soft-core sports coupe. Powered by a 2.0-liter turbocharged 4 cylinder, it possesses potent outputs of 292hp and 280 lb-ft of torque. Power gets split between all 4 wheels via a single gearbox choice – a 6-speed dual clutch S tronic. A Black optic package bags the TT S high gloss black mirror housings, 255/30 summer tires, and 20-inch matte titanium wheels. Available safety features include a rear view camera, park distance sensors front and rear, and stability control. Beneath the top rung RS model from Audi Sport, lesser S models bridge the performance gap. 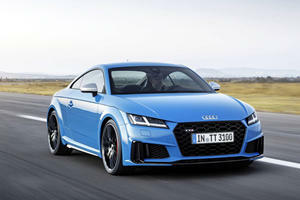 The TT S is no exception, bridging the gap between the already impressive TT, and the supercar baiting TT RS. Available only as a coupe and with familiar all-wheel drive and a new 292 horsepower engine, the TT S shares its underpinnings and engine with Volkswagen’s Golf R. But make no mistake, the TT isn’t some ordinary family hatch, this is a genuine sports car – perhaps for the first time in its 3 generations of existence. Audi’s interiors are special places, and with the virtual cockpit taking place as standard behind the wheel of the TT S, this interior is no exception. The fully customizable instrument cluster displays not only driving information, but navigation and audio information and controls too. Because of this, there is no central infotainment screen, which becomes troublesome if you prefer your passenger controlling the music while you focus on driving. Strapped into the front S Sport seats, available in either leather or Alcantara, with quilted stitching, you wouldn’t want to focus on anything but driving. The front buckets hold you in place and offer an exceptional seating position with plenty of space to get comfortable. The rear seats (this is a 2+2 coupe) don’t afford the same luxury of space. Back there, it’s only suitable for small children, and on short journeys too – this is no 911 for practicality. Audi’s magnetic ride control is standard on the TT S – linked to the Audi Drive Select controller. The adaptive dampers ensure comfort when needed, and supreme road holding when the situation demands it. But even in comfort mode there’s a slightly harsh edge to the suspension’s behavior. However what remains the same are the incredible levels of grip. Despite the quattro-branded all-wheel drive, the system is actually a front-drive Haldex based system. Not that it matters much, the system can preemptively send 100% of the torque to the rear wheels when needed to almost completely mitigate understeer and even induce oversteer. But there’s inertness to the TT S. Despite it being rapid and grippy, it fails to engage. The electric power steering is partly to blame as it feels cold and numb, but the chassis tune as a whole makes the driver feel like a remote pilot rather than an integral part of the experience. The motor beneath the hood of the Audi TT S is a familiar one from Volkswagen – the 2.0-liter EA888 turbocharged 4 cylinder shared with the Golf R. In this instance, it generates 292hp and 280 lb-ft of torque. A 6-speed S Tronic dual clutch automatic handles all the shift-work and send power to all 4 wheels. Strong, linear outputs and all-wheel drive ensure rapid performance that leaves more expensive machinery for dead, with a 0-60mph sprint of a lightning quick 4.6 seconds. The dual clutch not only ensures rapid shifts, but joyful flatulence on hard up shifts. As a nearly top spec model, the TT S enjoys a healthy list of standard equipment including the virtual cockpit, LED headlights, automatic climate control, heated front seats, keyless entry, rear-view camera, and front and rear park sensors. The technology package offers MMI Navigation Plus, a 12 speaker Bang & Olufsen audio system, and Apple CarPlay and Android Auto functionality. 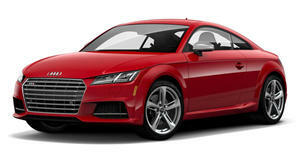 Although not locally crash tested, the TT features safety tech such as dual-stage airbags, ABS with EBD, and stability control. LATCH anchors are present in the rear seats too for the fitment of child seats if need be. Brutally quick, but lacking the involvement of even the Volkswagen Golf R, the Audi TT S is every bit a sports car except for that engaging drive. It’s so very nearly a credible rival to the Porsche 718 Cayman, but it’s not quite there yet. The new special edition Audi TT 20 Years is inspired by the original 1995 Roadster concept. A public debut isn’t expected until the Paris Auto Show later this year. 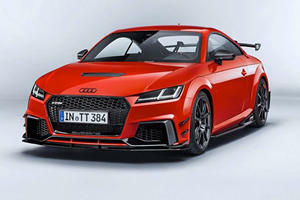 Audi is also showcasing its Sport Performance parts for the TT RS.